Since you received the home in the settlement, chances are your ex-spouse will want his or her name removed from the current mortgage obligation if one exists. That means you will need to refinance the existing loan into a new mortgage placed in your name only. The same goes for any second liens or Home Equity Lines. At the closing of the refinance, the existing liens are paid in full with the proceeds from the new mortgage. At the same time, a new deed transferring title to the property in your name only is created. Note – simply executing a “quick claim” deed removing your former spouse will remove them from title to the property, however it will not remove them from the current mortgage obligation. Only a refinance can accomplish that. If your income consists of alimony and/or child support – and you need that income source to qualify – this income must continue for at least 3 years after the closing of the refinance in order for a lender to consider it “acceptable” income for qualifying purposes. Typically alimony will continue for at least 3 years after a divorce. However, child support should be carefully reviewed to make sure it will last at least 3 years from the date of the refinance. In other words, if your oldest child will turn 18 in two years and your court ordered agreement states that child support will then be reduced or eliminated at that time, support for this child cannot be used as income to qualify for the refinance. A bit of good news – if you need alimony/child support to qualify, lenders typically want to see at least 6 consecutive bank statements evidencing you received payment from your former spouse in a timely manner. However, the underwriters for American United have now agreed to accept a 3 month history of receipt only! This applies to conforming conventional loans. While a 3 month difference may not seem like a big deal, for those looking to move on with their life, this guideline change is something to celebrate. If your property settlement agreement indicates that your former spouse is to receive a cash payment upon refinancing, you’ll need to request a “cash-out” refinance. 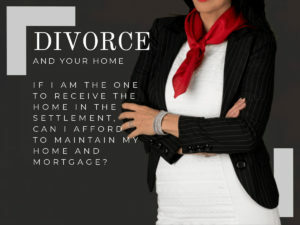 That is, you will request a loan amount for more than you currently owe on the property in order to provide your former spouse with a cash settlement at closing. Cash-out refinance loans typically carry loan-to-value restrictions, limiting the new loan to 80% of the property value. And they normally carry higher interest rates than standard non cash-out refinances. A bit of good news – the underwriters at American United will no longer consider the cash settlement required by a court ordered property settlement agreement as “cash-out”. That means, the loan-to-value restriction is removed along with the higher rate. Good news indeed.